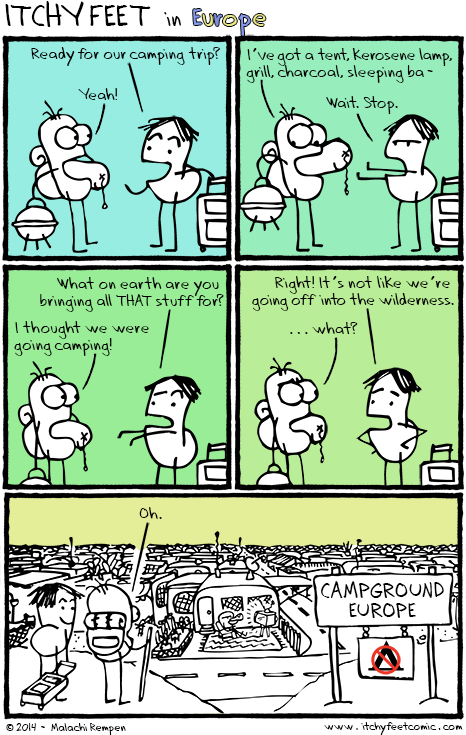 Where did you go camping? There are some wild areas! :D This reminds me of going "caravaning" with my english girlfriend's family... RESTAURANT IS RIGHT THERE! So true! Feels quite strange to have your small tent between several white walls of caravans. It's just like that here in Spain :D I went "camping" with my family every year when I was a kid and sometimes you were woken up by the guy snoring in the tent next to your spot. Then, about 6 years ago I went camping in New Zealand and it was a whole different thing, way better of course. A hotel room would probably have had more peace and quiet! At least then you're not lying to yourself about the "great outdoors"! Now that's just plain outrageous! ;) Sure, those places exist, they are common for family holidays in over-touristy areas, mostly South (parts of Italy, Spain, France, Croatia), but never have I seen a higher number of RVs and RV spots per campground than in the US (and boy what outrageously HUGE RVs they are). In fact, tent spots are usually added on in a remote area as a kind of afterthought, usually on the meadow where rain water collects. Often I found myself looking at a price list and determining that apparently I can camp for free because prices were based on cabin, car, RV, or at the very least a bike. In the actual wilderness (that 99% of Americans never get to see because you cannot reach it by car) on the other hand there are essentially NO camp grounds worth calling that name. Mosquito ridden more or less flat spots that *might* have a squat toilet. That might be locked. but lets just look at the telltale items you claim to carry into the "wilderness": Kerosene lamp, grill, charcoal. What forest are you planning to burn down and how are you pretending to carry these more than 100 meters away from your car, son of the 24h camp fire nation? I suppose the comic betrays my own bias. Where I'm from in New Mexico there are enormous swathes of public, road-accessible BLM land which you can camp on free of any human development aside from roads. It's easy to hike off the road with a backpack carrying all those items and have a fine time. Sure, you go to Yellowstone National Park, and you're bound to find plenty of giant RV parks (many of which are driven by Europeans), but believe it or not, America is quite large. There are hundreds of thousands, if not millions of square miles of free, open, accessible land on which to camp. I see similar campgrounds around and about the US, mostly private campgrounds in random spots I can't quite see camping at. I camped in similar setups but those were at Grateful Dead Concerts at Alpine Valley. The camping I have done was hardly isolated and alone, but it was in the woods and we had some space. The US Federal campgrounds are not too bad, and if one does not want to stay in the campgrounds, it is no big deal to hike into the woods and find a spot to pitch a tent. Living in the upper midwest the notion of starting forest fires is not really a concern.Out west it sure is, but the notion that someone hiking into the woods with kerosene, charcoal, and grill is going to burn anything (other than a squirrel or two) is silliness.